The guide has been written by Rab Anderson, Kevin Howett and Colin Moody, who have been driving forces in the development of the Islands, and their insight and local knowledge is contained within to help you plan your trip and get the most out of it when you are there. For the first time in recent history, the jewel of Scottish (possibly even British!) sea cliff climbing gets the SMC comprehensive guidebook treatment. 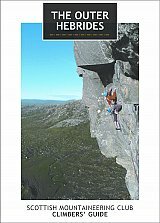 Written by the activists themselves, this guide provides the go-to resource for climbing in the Outer Hebrides. Uninhabited islands, committing sea cliff adventures, seaside cragging, mountain cliffs and the mighty Sron Uladail - all in one book. - 2500 routes from Moderate to E9 - 28 detailed maps and access information - 177 photo diagrams covering all major cliffs (and then some) - Tens of new future classic venues - Hundreds of new routes throughout the Islands - Comprehensive logistical information to help you plan your trip - Inspiring action photos in full colour throughout This guide provides comprehensive cover and photo diagrams to all of the popular areas, as well as publishing for the first time tens of new future classic venues and hundreds of routes, capturing all of the development that has taken place in recent years. Amongst this detail you can also find information on areas still under development, with possibilities for new routes of your own! Note-worthy is the fact that this guide provides options for the hard-core climber on a dedicated trip, as well as those wanting the option of a day or two out cragging whilst on a family holiday.